Esperaza, which is 5 minutes from Couiza in Aude, boasts a Dinosaur Museum and Hat Museum that stand side-by-side, with one ticket allowing entry to both. As might be expected, the Dinosaur Museum is the larger, with 3000 m2 of expositions. 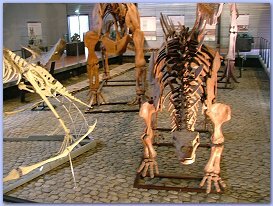 Signs are written in English and French, which is a big help and their are numerous skeletal reconstructions, models of dinosaurs, collections of fossils and the like. It is breathtaking to see life-size reconstructions of dinosaurs and features in the museum are regularly added to, with a recent addition of a drawing section where children can shade their pictures with different 'dinosaur skin', which adds an interactive element. The hat museum provides a fascinating history of hat making, with various traditional pieces of machinery, which can be played with, so this is a much more hands on experience. Scroll down for photos, or click for more photos of the Esperaza Museums. 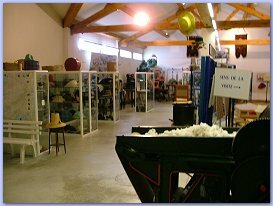 A list of other museums in Aude, can be found on Aude Cathare (which is in French, but includes information such as opening times and prices, which are simple enough to understand even if you don't speak French). Dinosauria, as it is known, is open all year round in the afternoons and all day from February to October. In July and August it opens from 10 am to 7 pm. It is located at 11260 Esperaza, Haute-Vallee de l'Aude, tel 0468 74 26 88 or 0468 74 02 08. Musee du Quercorb in Puivert is a well renowned museum that illustrates traditional life through a series of faithfully reconstructed settings. It's 4 Euro's for adults and 1 Euro 60 for children. It's open April-October. April to mid July & Sept: 10AM to 12.30PM, and 2PM to 6PM. July & August: 10AM to 7PM. October: 2PM to 5PM. While in Puivert you can also visit the castle and swim in the lake. The Musee des Automates in Limoux has over 100 marionettes, open all year round in the afternoon.